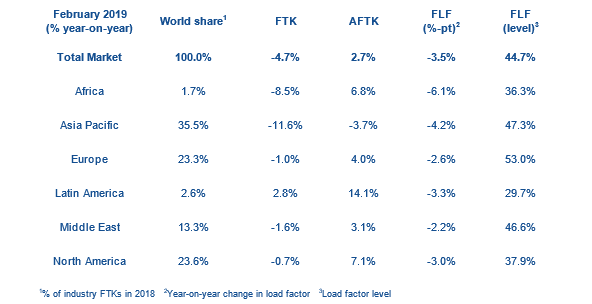 Air cargo traffic declined again in February as the industry had its weakest month in terms of growth in the last three years and load factors tumbled again. Data from IATA shows that freight tonne kms declined by 4.7% year on year in February, while freight capacity was up by 2.7%. it is the third month in a row that the industry has recorded a decline. With supply growing faster than demand for the twelfth month in a row, load factors were down again – slipping by 3.5 percentage points on a year ago to 44.7%. Freight traffic for January and February combined is 3.1% behind the first two months of last year. IATA said that demand for air cargo continues to face significant headwinds as a result of trade tensions, weakening global economic activity and consumer confidence and the Purchasing Managers Index for manufacturing and export orders has indicated falling export orders since September. IATA’s director general and chief executive Alexandre de Juniac said: “Cargo is in the doldrums with smaller volumes being shipped over the last four months than a year ago. The organisation lowered its growth expectation for the year to 2% from 3.7% at its recent World Cargo Symposium as the impact of the China-US tariff war was greater than expected. However, there is some anecdotal evidence that China-US and Asia-Europe trade lanes saw an improvement in March. Looking at the regional results, all regions reported a contraction in year-on-year demand growth in February 2019 except for Latin America. Asia-Pacific airlines saw demand for airfreight contract by 11.6% in February and capacity decreased by 3.7%. North American airlines saw demand contract by 0.7% during the month while capacity was up 7.1%. IATA said this was the first month of declines recorded since mid-2016, reflecting the sharp fall in trade with China. The organisation said the decline was consistent with weaker manufacturing conditions for exporters in Germany, one of Europe’s major economies. “Trade tensions and uncertainty over Brexit also contributed to a weakening in demand,” IATA added. Middle Eastern airlines’ freight volumes contracted 1.6%, while capacity increased by 3.1%. “A clear downward trend in seasonally-adjusted international air cargo demand is now evident with weakening trade to/from North America contributing to the decrease,” according to IATA. Latin American airlines posted the fastest growth of any region in February with demand up 2.8% but capacity increased by 14.1%. Despite the economic uncertainty in the region, a number of key markets are performing strongly. Finally, African carriers saw freight demand decrease by 8.5% in February, outstripping a 6.8% increase in capacity.